Pierre Gasly (Team Mugen) scored his second victory in the 2017 Japanese Super Formula Championship today at Autopolis. 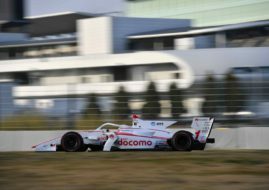 The French driver of the #15 Honda won the race ahead of another youngster from Europe, as Felix Rosenqvist (Sunoco Team LeMans) finished in the second place. Kazuya Oshima completed a podiums, make it a double podium for Sunoco Team Le Mans. All three drivers on a podium made a significant progress during the race. 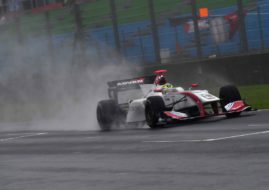 Gasly started from P5, Rosenqvist was tenth fastest qualifier while Oshima was 15th on the grid. 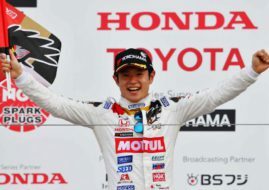 Hiroaki Ishiura finished fourth in the sixth round of the championship and stayed on the top of the championship standings with two more races on a calendar. Ishiura has 30.5 points, Gasly is second with 25 points and Rosenqvist is third with 24.5 points.